i'm not a game historian, so we aren't going to get anywhere with this. 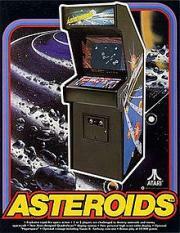 Another Atari hit from the 70s. This one re-purposed the control scheme seen in earlier attempts like Computer Space into a game with more approachable and faster-paced action. I see the appeal, but I was never that good with these types of controls. It is what it is - playable, but in terms of space shooter arcade-type games I'd certainly go for Space Invaders or Galaga over it. One of the all time greatest games ever and a personal favourite.